Reminds me of the painted cats. Rachel, I do love the idea of painted cats. In the spirit of the time, I’m considering believing that the cat really is an angel. On the other hand, there’s the human companion’s story, which is that the poor cat got very stressed during the last spell of hot weather when lots of the female cats in the neighborhood went into heat and starting hitting on him. Ursula K. LeGuin has a lovely collection of children’s stories about winged felines, called Catwings. My son just loves them. Just a guess, but I think the wings are likely due to poor grooming. 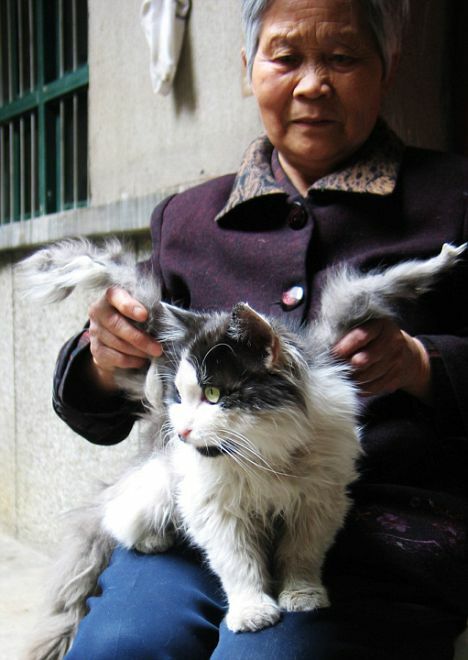 The cats are long-haired and require daily grooming to keep their fur mat-free (the mats are painful in that the bigger they get, the more they pull on the skin). It sounds like they’re pets, but they don’t look like they receive all the care they should.